Even though this was the album that really put Modest Mouse on the map, I still wasn't following them at all when this record first came out. I do have vivid memories of seeing it sitting around in record stores, but I never wanted to buy it. I thought I knew Modest Mouse and was pretty confident that I did not like them. After changing my mind on the band in the early 2000's, I went backwards and added The Lonesome Crowded West to my CD collection. 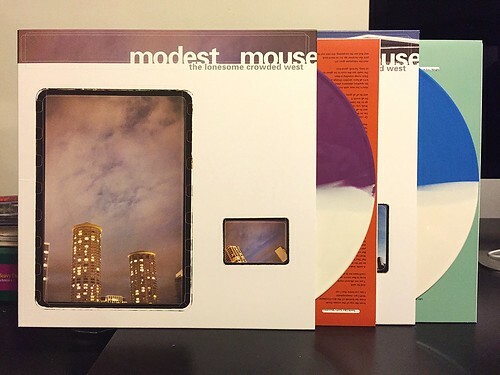 The vinyl was hopelessly out of print and even though I had finally come around to Modest Mouse, I certainly wasn't about to pay the insane prices that the vinyl version was going for. At its peak I'd seen it for $300 - $400 and I just don't like this record that much. For years there were rumors about this reissue and when it finally was announced last year, I jumped at the chance to grab the wacky limited colored version from Newbury Comics. Sure it was a few dollars more than the black vinyl, but I am just a complete sucker for split colored vinyl. I think it came out looking great. They kept the two sleeve layout of the original version and they did a decent job of matching the vinyl colors to the artwork. Musically it was silly of me to have written off this record before I ever heard it, but I've had over 10 years of this being in my CD collection, so I have had a chance to make up for lost time. I'd argue about whether or not this is definitely the best Modest Mouse record, but it is very, very good. It still has the ramshackle feeling of their first release, but they were absolutely becoming a more polished band at this point. Maybe they weren't writing full on pop songs yet, but you could tell that they were growing as musicians and songwriters. It's a record that still sounds pretty fresh even though it's nearly twenty years old. For Modest Mouse Monday next week, I'll be going over The Moon And Antarctica. That's the Modest Mouse record that finally brought me on board.